IRES partnered with New Home Source to help YOU. Typically, agents do not have t he tools to effectively meet new home buyer needs. That’s a shame since 18% of home shoppers prefer new homes and 37% would consider one. Plus, new home prices exceed resale homes by 46%. So, new homes are a win-win. Chosen by NAR as its preferred new home data provider, New Home Source Professional fills in the gap. Rather than searching builder websites for plans, promos, and community info, BDX (Builders Digital Experience) collects all that information directly from builders and updates their data every night. All builders on the site have agreed to pay agent commissions. Contact them for the details on any listing detail screen. 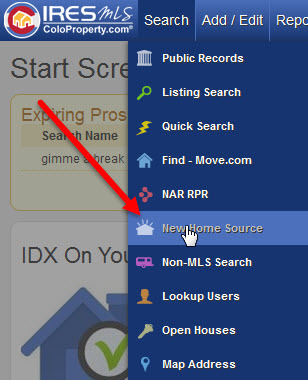 If you do nothing else, go to the Search menu on I RESis and click the “New Home Source” icon. By doing that, you will start receiving the weekly email updates. If you see something that might interest a client, click the link and email them a brochure. If they express interest, you can contact the builder directly with any questions and schedule an appointment through the site. If you aren’t sure how to sell new homes, visit the “Articles & Advice” section to get started. This could open up some interesting and lucrative new doors for you. Give it a try. We’re here to help.